In the Middle Ages green onions made their way into Europe. Today they are a staple in many North American kitchens. Most farmed green onions are scallions. They have dark green ends with bright white shaft that never matures into a bulb. 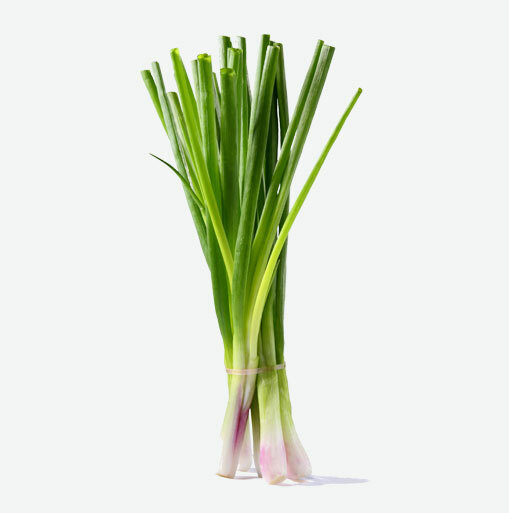 Regular onions, however, can also be picked in an immature state, yielding green stalks and an immature bulb similar to that of the scallion (in this case, the bulb colour will match the type of onion being grown). Green onions are low in sodium, and very low in saturated fat and cholesterol. They’re a good source of thiamin, riboflavin, magnesium, phosphorus and copper, and a good source of dietary fiber, vitamin A, vitamin C, vitamin K, and potassium. These nutrients are important to maintaining good health. Remove any rubber bands or damaged leaves from the green onions. Wrap them in plastic wrap or a plastic bag and store them in the vegetable crisper section of the refrigerator for up to five days. Store green onions away from odour-absorbing foods such as corn and mushrooms. Avoid green onions that have wilted or yellow leaves, or that have curved or frayed ends. Green onions can be eaten raw or cooked into a variety of dishes. Like many foods, the longer the green onions are cooked, the weaker their flavour will be, so it’s best to add the onion at the end of cooking. While the green leaves can substitute for chives, the white shaft is often used in the same way as a common onion. Green onions can be used as a garnish or seasoning, grilled or sautéed, and they can be added to vinaigrettes, dips, omelets, pastas, and many meat and seafood dishes.